So, Ali is alive then? If she isn’t, who killed her? Was Ali the second redcoat? Where did CeCe disappear to? And speaking of disappearing, will we see Jason again soon? Are Melissa and Wren hooking up again? Or are they both secretly evil? Why is Wren creeping us out lately? And speaking of evil, why is Ezra a baddie? Is there only one ‘A’? Did he ever love Aria? Is Aria gonna dump Jake? Will Ezria make things work? We know Marlene ships them like crazy. And speaking of ships, Caleb isn’t really leaving, right? And Paige and Emily don’t really have to break up, right? And Spoby are gonna get married and have little Spoby babies, RIGHT? But seriously? Is Ezra really ‘A’? FOREVER IN DENIAL. And did he kill Ian and Wilden and all that? So many murders left unresolved in this town. Moving on… What’s going on with Mona? Can we PLEASE know what’s going on with Shana soon? A little background info would be nice here and there. Like, what’s her deal with Ravenswood? Who tried to drown her? CeCe? Why was she scared of CeCe anyway? AND WILL WE GET MORE QUESTIONS THAN ANSWERS IN 4B? Most probably. So, the Halloween episode of PLL will take place in Ravenswood. Yes. We see you, Ezra. Looking mysterious and… well, hot. And the season premiere of Ravenswood will take place immediately afterwards. The song featured in this promo was by The Civil Wars, and is called ‘The One That Got Away’. Listen to it here. In the meantime, are there any questions you’re dying to know the answer to? Let us know on Facebook and Twitter! This entry was posted in Pretty Little Liars, Television Shows and tagged A, Ali, alison, answers, Caleb, Civil Wars, Emily, Ezra, Ezria, Facebook, Grave New World, Haleb, Halloween, Hanna, marlene, marlene king, Paige, PLL, Pretty Little Liars, questions, Ravenswood, Spencer, Spoby, Toby, Twitter, who is A. Last night’s episode of Pretty Little Liars had us on the edge of our seats, and next week’s summer finale promises even more. Red Coat: We saw the coat, and we might have seen her. The writers have been leading us to think that Red Coat is Cece Drake, and after this episode, there was some pretty solid evidence. Cece was seen in a room covered in Ali’s photos, on the phone to a mystery person (fans seem to think Wren, but whoever it is, it shows she’s working with someone!). And of course, the thing that set our hearts racing… The red coat on her chair. Later on in the ep, Red Coat is spotted at the Hoe Down… The girls attempt to catch her, and end up with the coat. Cece is later seen wearing black instead (lose your coat, Cece?) and eavesdropping on Ezria. My, my. Cece is definitely up to something, but whether she is in fact ‘A’ or even ‘Red Coat’, we will have to wait until next Tuesday to find out! Ezria: Emily gets Aria to finally talk to Ezra so he can open up to someone about all of his troubles. Jake has a few words with him, which leads Ezra to back off a little, but Aria turns up at his apartment and the episode ends with a heart-touching hand-holding moment for the former lovers. And while Aria and Jake shared the cutest little country dance, I think I will always ship Ezria. Travis: New boy on the scene, and is that ever a good thing? Can we trust this boy, who, believe it or not, actually begins the episode stalking Hanna? But he may just save the day, as apparently, he was there the night of Wilden’s shooting and could be a great help in Ashley’s case if he can testify that she left before he heard gunshots. Spoby: With Spencer desperately wanting to protect Toby from falling deep into ‘A’s traps, she tells her friends about Toby’s mother. He is hurt that she chose them over him… They better kiss and make up next episode! It’s been, like, forever since I saw those two getting hot and heavy. So, the Liars are in Ravenswood. What could have led them back there? In the above sneak peek, the girls witness a magician’s disappearing act in the aforementioned creepy town. Also, there is a lot of speculation that the magician is actually Alison. What do you think about that one? As for the title, “Now You See Me, Now You Don’t”, this probably refers to the disappearing box trick in Ravenswood. However, it could also be a sly hint at the way in which Red Coat/’A’ seem to appear and disappear. It could even refer to Ali as she tends to do the same. Or is it a direct reference to Jenna and her sight? Man, those guys are clever with their sneaky episode titles. It drives me cray cray. And what on earth do we make of this…? Magic Eight balls. “If she goes free, you’ll hear from me. Kisses – A” Yep. I’m officially tormented by what will happen this episode. And for those Aria-is-A theorists… Aria was holding the “A” ball! I read a really convincing post that Aria could be A, saying she has a personality disorder and mental illness runs in her family. You can read it here: http://idontneednoroad.tumblr.com/ariaisa (All credit goes to idontneednoroad). 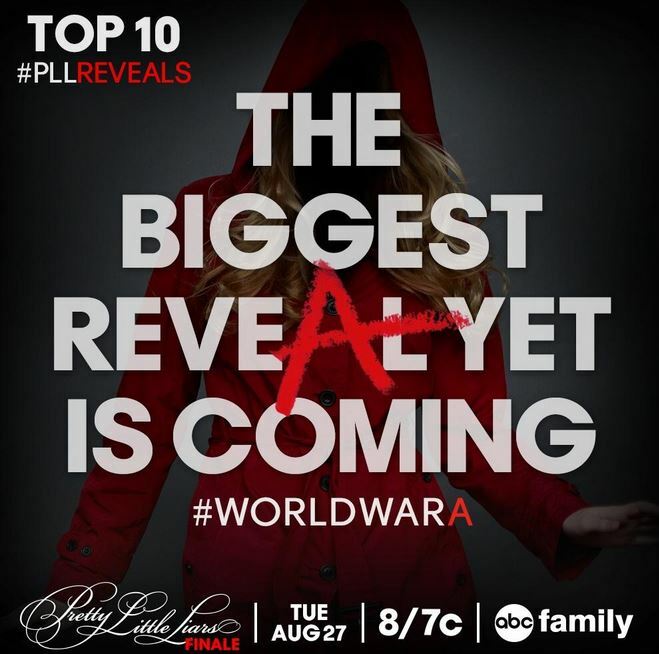 And to further back this up, the official PLL Twitter page tweeted the poster below… Could this mean that the reveal will be the identity/identities of Red Coat? The fact that Red Coat is to be revealed this episode raises even more questions about Cece and her actions in 4×11. Does this mean she isn’t Red Coat? Ahh. Travis, who was introduced last episode, was featured in another sneak peek from #WorldWarA… Do you think he helps Ashley’s case, or not? You heard her. EPIC. But did we really expect any less? Yeah… I’m pretty sure this episode will send me into a coma until the Halloween episode. OMG. All these questions that keep me up at night… They might actually get answered! We’re finally going to know! I am just dying. I can’t wait another week! Can you? Share your #WorldWarA and Red Coat theories with us over on Facebook and Twitter! This entry was posted in Pretty Little Liars and tagged #WorldWarA, 4x12, ABC Family, Ali, Facebook, Halloween, Now You See Me Now You Don't, PLL, Pretty Little Liars, Ravenswood, recap, Summer Finale, theories, Travis, Twitter, World War A.